The new Panditarama Sydney meditation centre is set in 1690 sqm block of land in Smithfield, 30km west of Sydney’s CBD. It is on a quiet street and allows the peace and quiet that the residents of the centre enjoy. It is the perfect place for meditation study and practice. Consisting of 3 bedrooms for Sayadaws, and extension is accomplished in its backyard including renovated Dhamma Hall, men and women dormitories that contain 7 and 10 single beds respectively. Once the funds become available, single room accommodation will be provided. Two separate bathrooms have been rebuilt as part of renovation. In addition, to be able to practice meditation comfortably, split type air-conditioning is installed in each room. We offer free food including breakfast and lunch to Yogis with the support of our Dhamma friends. For those who are vegetarian, we can also provide two simple meals. So any amount of your donation is appreciated and it helps us continue providing generous service to those who wish to practice meditation. 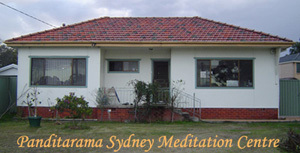 The Panditarama Sydney Meditation Centre (PSMC) was founded on the 6th February 2000. It was opened by the Venerable Sayadaw U Panditabhivamsa of Panditarama Shwe Taungone Meditation Centre, Yangon. The centre is located at 70 Market St, Smithfield Sydney NSW 2164 Australia, Ph: +61 12412341234. See map for more details. This meditation centre was formed in Sydney because there was a need for the elderly people to meditate anytime nearby and also for working people to meditate on the weekends. Our Sayadaw U Pannathami, the abbot of the meditation centre, provides this service free of charge. We accept any meditators worldwide and provide them with food and lodging free of charge in addition to lectures on Vipassana meditation. We warmly welcome any Dhamma friends, Buddhist or non-Buddhist who want to experience the Dhamma. The Buddha said that "Wisdom, indeed, is born of meditation; without meditation, wisdom is lost. Knowing this two-fold path of gain and loss, one should conduct oneself so that wisdom may increase". The centre’s aim is to promote the teaching of Theravada Buddhism particularly the practice of Satipatthana Vipassana meditation in the tradition of Mahasi Sayadaw (Satipatthana Vipassana) of Burma. Our centre is a non-profit organisation and our Chief Abbott is Venerable Sayadaw U Pannathami who has been a Buddhist monk and teaching mediation globally for over 20 years.